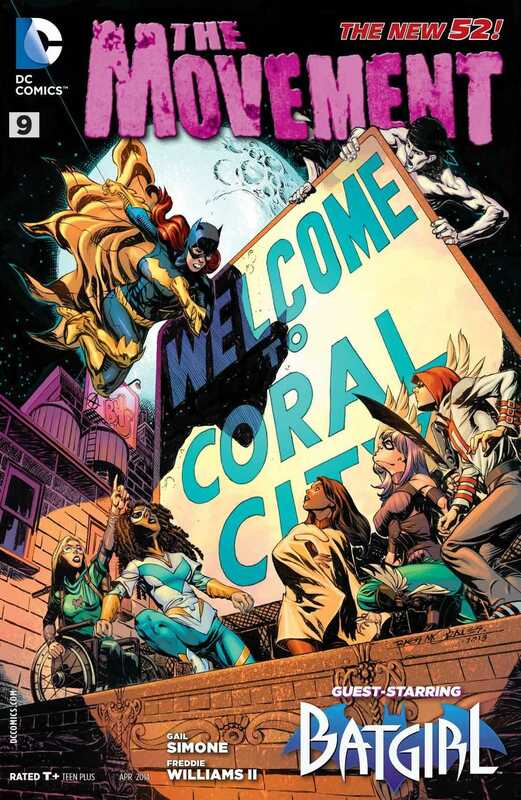 Chasing a self-proclaimed superhero, Batgirl arrives in Coral City but immediately runs into The Movement and their supporters. One thing that Gail captured really well is the “culture shock” that Batgirl experiences in the city, plus the whole subtle chemistry between Batgirl and Vengeance Month, with regards to the former having been wheelchair-bound until recently, and the latter being currently wheelchair-bound. These are the sort of things that I was expecting to see in this issue, and that’s exactly what Gail delivered on all the way through. What matters most is how many different things that Gail juggles in this issue in terms of the narrative. We have a rogue “hero”, we have one of the most popular female superheroes leading the charge in bringing him to justice, we have our dysfunctional group of misfits and heroes, we have rivalries coming to the fore, we get backstory on Virtue and how that ties into her role as the leader of The Movement, we have the developing relationship between Mouse and Tremor, and so on. Each and every one of those elements comes together to make this one of the better issues of this series. All the different subplots that Gail threaded together in the first eight issues of the series, other than the overall arc for those issues, are now finally getting developed more and more. I love what Gail is doing in this series. She makes Batgirl fit right into the world of The Movement, its all so natural, and yet we also see how she might not be the perfect fit, which is a really interesting dichotomy to explore given the sort of character that she is, and the sort of characters that the members of The Movement are. And since we have Batgirl here, not to mention the ever-lovable Mouse, there is plenty of humour here in this issue other than all the brutal action, such as the throwdown between Batgirl and Katharsis. Humour is one of Gail’s strengths with her comics, no matter what genre or character or setting that she is writing in, and The Movement #9 is one of the best examples of that. With the art, I sometimes felt as if Freddie Williams had changed around the visual designs for some of the characters, particularly Katharsis, who seems to switch in her looks from panel to panel. But all the same, Freddie draws the epic fight between Katharsis and Batgirl really well. Lots of action, lots of punches and kicks and reversals, and everything executed pretty much perfectly. That’s really all that I wanted from this issue as soon as I saw how Gail ended the previous issue. And as usual, Chris Sotomayor’s colours were always on point. Other than Gail’s writing and Freddie’s interiors, Chris’ colours are one of the main reasons why I come back to this comic every month, and why I enjoyed it so much as well. The issue ends with a really interesting cliffhanger that ramps up the seriousness of the story-arc and marks an interesting possible change in Batgirl’s status quo, and even for The Movement itself. Given what they are about to do to Batgirl, I’m expecting a big story in the next issue. More The Movement: #1, #2-3, #4, #5, #6, #7, #8. Posted on February 8, 2014, in Comics Reviews, Review Central and tagged Barbara Gordon, Batgirl, Characters of Colour, Chris Sotomayor, Comics, Comics Review, DC Comics, Demons, Disabled characters, Female Characters, Freddie Williams II, Gail Simone, Humour, New 52, Review, Review Central, Superheroes, The Movement, Vengeance Moth, Vigilantism. Bookmark the permalink. 5 Comments.